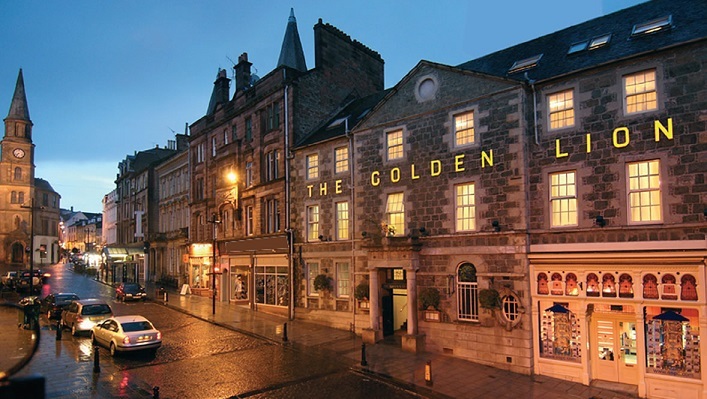 The brainchild of local merchant Robert Wingate, Wingate's Inn - now the Golden Lion Hotel - opened it's doors in 1786. Built to a design by Gideon Gray, it was part of a campaign to gentrify the downtrodden King Street - kinown ironically at the time as 'Quality Street' - it soon established a fine reputation, running it's own carriage services to and from Perth. It has maintained its reputation for more than two centuries. Whence grovelling reptiles take their birth. Who knows them best, despise them most! Realising that calling King George III a 'reptile...to honour lost' might leave him open to a charge of Sedition, Burns returned two months later...and smashed the window with his riding crop. This distressed Wingate...who had been making a tidy sum for eight weeks, charging visitors to read the poet's celebrity graffiti. He had a local glazier engrave another window pane, and the glass remained a profitable attraction until it was shattered during a fire which threatened to consume the building in the 1950s. Today The Golden Lion retains its fine reputation, and the legacy of Robert Burns was further celebrated in 2016 with the opening of Cronies restaurant, and the unveiling of a new painting of the poet and his drinking companions by local artist William Dobbie, on Burns Night (25th January) 2017.